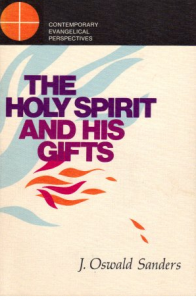 This book on the Holy Spirit was first written in 1940 and then revised by the author in 1970. I found that most of the major works on the Holy Spirit in the last century referred to Sanders in some way. It is a thorough study of the major areas of pneumatology and also includes three chapters on the gifts of the Spirit as well as Deity and Personality. Unfortunately, Sanders does not rule out tongues speaking for today. He does, however, warn of its abuses and counterfeits.